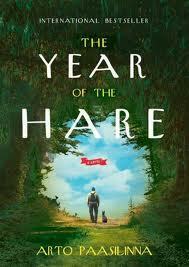 The Year of the Hare (Finnish: Jäniksen vuosi) is a 1975 novel by Finnish author Arto Paasilinna. One day whilst on vacation a middle-aged man named Kaarlo Vaatenen and his photographer buddy (who was driving) ran over a hare in the road. The hare was injured so Kaarlo got out to find it. His friend waited, called, looked around and finally before Kaarlo got back, left. Kaarlo really didn’t want to go back to his wife in Helsinki and his job there as a reporter. So instead he put the hare under his arm and started walking north. First he he found a vet in a small town. Then he called a friend, sold his boat for the cash, and kept going. He’s seeking freedom and finds more than that. The stories are what happens as Kaarlo wanders from job to job meeting people and having adventures. Kaarlo is a very decent man and there’s no quest involved, no destination. Kaarlo enjoys helping people so he does and when money comes his way he uses it judiciously. Yet, and I think this may be part of the point, Kaarlo might be considered strange and he is – but who are we to judge? He’s just living his own life, one day at time, the way he wants to live it. That’s it (fwiw) – The themes are obviously freedom and solidarity with both humanity (the common man) and nature (hares, cows, trees) – and it’s set in the wilds of Finland. Life is good. The novel has been translated into over a dozen languages including English, French, Hungarian, Italian, Dutch, Swedish, German, Slovenian and Estonian (a cult-classic in Finland and France). It is Paasilinna’s most widely read work and was included in 1994 in the UNESCO Collection of Representative Works which funded the 1995 English translation by Herbert Lomas. It was adapted twice into feature films: a Finnish 1977 film called The Year of the Hare, and a 2006 French film directed by Marc Rivière called Le Lièvre de Vatanen.